Daystar aims to create something unique. Ghost, the creative force of the group, has linked up with other likeminded individuals to combine their talents into one singular vision and execution. Ms. Day is not only a creature of beauty, mystery and great technical skills she also has a very uniquely beautiful voice that resonates throughout Daystar songs. Lefty is a super versatile musician, playing multiple instruments and being one of those human beings that can adopt a new skill without effort. Ghost´s creative process is unique in a way that he experiences flashes that are accompanied by an creative experience ranging from visual designs to full songs. Following these flashes Ghost sets out to recreate what he has experienced. 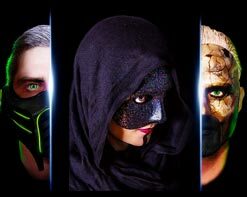 The first single from their upcoming full length album, Rise, is the appropriately titled “Thrasher,” a scathing and gritty industrial electronica track that announces Daystar’s arrival on the scene with conviction. All three members of Daystar have a chance to display their talents, with Ghost’s screeching vocals over the top of a musical bed intricately performed by Lefty, and brought to life through the work of Ms. Day. “Thrasher” the video is as complex, sinister, and hard-hitting as Daystar and their music. In order to match the song they knew they had to go big for the video! Enter Thor (The Mountain from Game of Thrones and Europe’s strongest man) as an unflinching 6’8″, 400 pounds cyborg determined to prevent the inhumanities happening around us. First, it’s stopping a predator at the playground from harming an innocent young girl, then to the depths of an industrial setting where he prevents a vicious gang attack on a helpless victim. In both these cases, however, he relies on more than just his physical prowess to prove his point. He also uses the technological modifications to his body to take something much more dear and permanent from them so they’ll never forget the errs of their ways. All of us here at HIP are ecstatic to be working together with Daystar to bring their unique vision and musical aesthetic to a wider audience. We would love to hook you up with anything you may need, including copies of the new album Rise, to get this video into your programming. Please contact Andy Gesner and the HIP Video Promo team at (732) 613-1779 or email us at info@HIPVideoPromo.com . You can also visit www.Facebook.com/ProjectDaystar/ for more info on Daystar.